Balancing poses in yoga are tricky. This is the part of our practice where we swear our mat has a mind of it’s own. Why does it feel like there is a mini earthquake grumbling beneath us during a pivotal balance moment? It’s hard to breathe and remain calm when our ankles are shaking and we find ourselves striking that ever-so-fashionable yogi toe death grip. When our mat feels more like a runaway magic carpet ride and less like a yoga mat, are we doing something wrong? The short answer is no. The 3 breaths we have to stick this pose could be frustrating and challenging for even the most seasoned of yogis. Push just a bit too far, and you face plant in a heap of limbs and sweat. So, how can you teach your body to stick that balance pose without shaking, falling or failing? The long and short answer is alignment. Don’t panic – you can do this! These steps secure all the bones and structures of the foot and support the ankle joint, ensuring the grounded foot is active and secure. Engaging both grounded and flying legs helps the muscles hold the bones up easily without the flying leg feeling like “dead weight.” This motion gets the shins and calves involved to stabilize the entire foot and ankle. 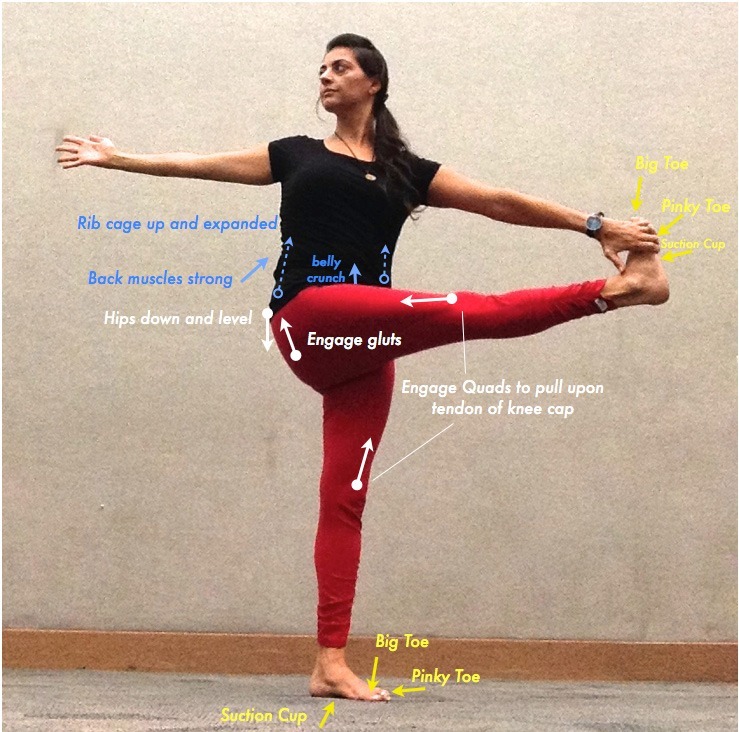 Active, strong, and secure knee joints ensure stability when we balance and transition between poses. The muscles of the knee flex upon the joint by engaging the tendons that hold the kneecap in place, creating a “lifting” motion and slowly drawing the kneecap up and into the thigh muscles. Let’s start by really standing on the grounding leg with everything we have. Pretend that the mat is about to float away, so you’ll want to press your whole leg down to hold the mat in place. We tend to sink down into our hips here as if we were holding a laundry basket. To avoid this and elongate out of that hip, we straighten the grounding leg and activate our thigh muscles to make some space for the hip crest to be free. No laundry basket can rest here now! Engaging the muscles and tendons that flank the thighbone of the grounding leg will help protect the kneecap. This provides us with both physical and emotional security in our practice. These actions support the hip joint and secure the pelvis from swaying forward. How can we tell we are doing this correctly? After following the directions, check by pressing your finger against the side of your kneecap of the grounding leg. If it’s lifted and engaged, you will not be able to budge it, wobble it, or move it back and forth. You may not know it, but your core plays a pivotal role in balancing the upper body with the grounded leg in any balancing yoga pose. A strong core stabilizes the spine and helps the upper body work as one continuous unit while balancing. This is a three-prong approach. Engage the lower belly muscles. It should feel like we are doing the best lower belly crunch of our lives. This action locks the pelvis in place, supports the lower back, and strengthens the lower belly/hip joint connection. 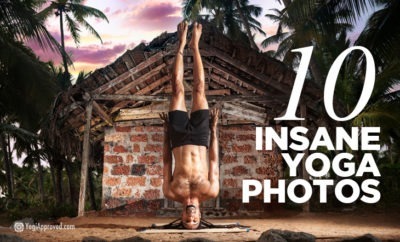 It also builds “killer” abs! 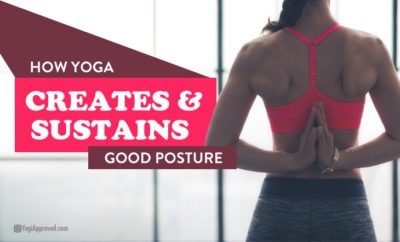 All of these actions together tone back muscles and abs while creating a mindful and active connection in the whole back body. A strong core acts as an anchor, and helps us find our flight or “fulcrum” in any balance pose, leading to less shaking, falling, and wiggling about. Hinging from the hip, Warrior III calls for lifting the “flying” leg up, stabilizing the pelvic bones to be parallel to the floor, and engaging the grounding leg for stability. 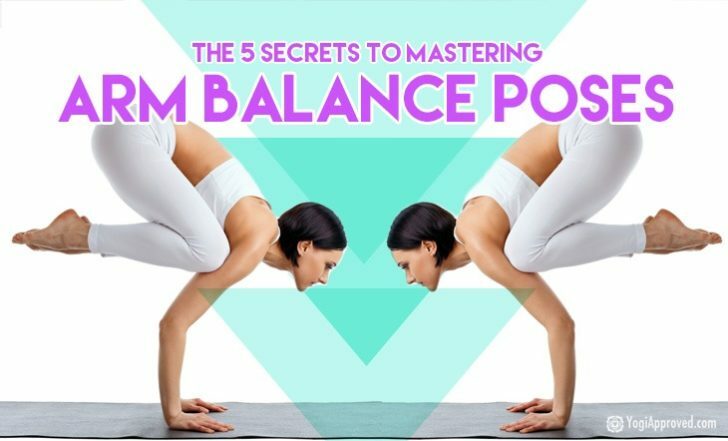 Finding Balance In Your Yoga Poses Is Within Reach! Remember that balancing yoga poses require concentration, precision, and accuracy. Just keep trying, practicing, and lifting. Yoga challenges us, makes us question ourselves, and demands our attention. These poses come with time, patience, and surrender. Follow these steps, stay with it, stay positive, and you will stick that pose. This article has been read 2K+ times. Feelin’ the love! Do you constantly feel distracted or unable to focus? 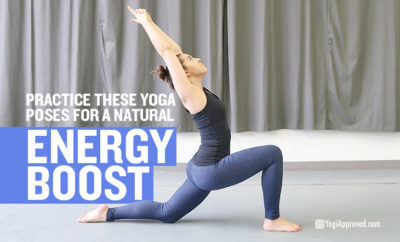 Yoga, and particularly balancing poses, can help! 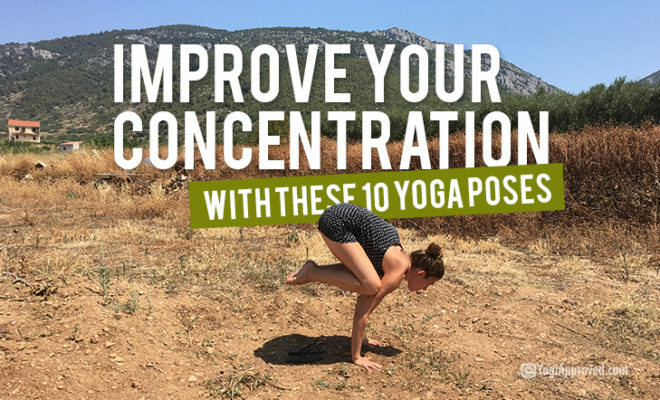 Practice these poses to improve your concentration. Melissa is a yoga teacher and Clinical Exercise Physiologist who blends the wisdom of yoga practice with the science of corrective exercise and nutrition. Melissa believes mindfulness is the key to happiness and brings that philosophy into her yoga classes, workshops, and writing. Yoga arm balances: the magical flying poses that can seem impossible. But, they're not! Add these five secret ingredients and you'll be flying in no time!